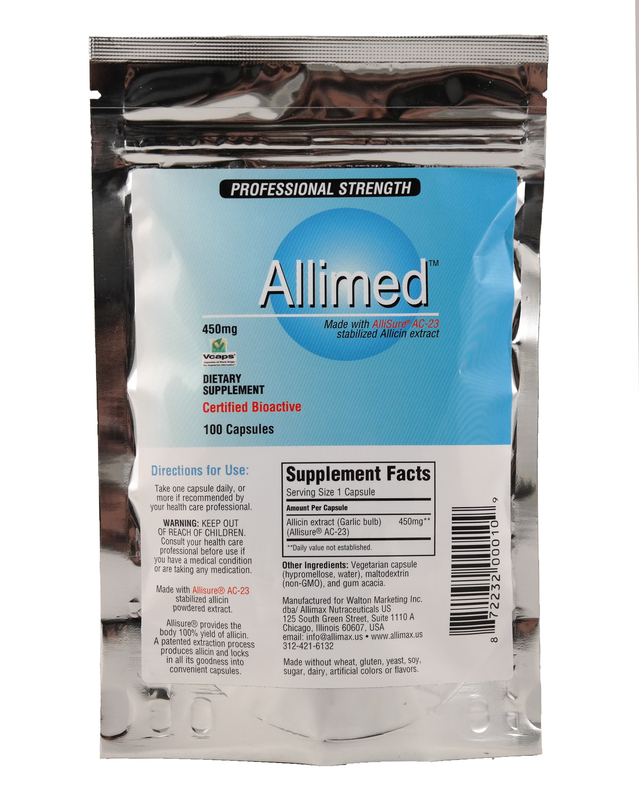 Allimed Capsules - 100% Allicin - 100 ct. Ingredients: AlliMed® capsugel vegetarian size "0" capsules contain 450 mg Allisure® AC-23 concentrated natural allicin extracted from fresh garlic. Casing is Non-GM maltodextrin. Free from artificial coloring, flavoring, salt, gluten and preservatives. Suitable for vegans and vegetarians. Formulation: Size "0" vegetarian capsule containing maltodextrin, gum acacia and allicin. Dosage: Up to 8 capsules per day may be taken if needed, and just one capsule a day of AlliMed with food can be beneficial for health and well-being. It is easily absorbed.